Jim Jarmusch — a director who has marched to his own tune since his 1984 breakthrough with Stranger Than Paradise — is a late attendee at the vampire party that’s been sinking its teeth into popular culture for the past several years. That may be part of the point. Jarmusch seems to be commenting on the generally woeful state of human affairs. Within the movie’s confined and airless world, only vampires truly appreciate the best of human achievement in the arts and sciences. Vampires dismiss the rest of humanity, which they seem to regard as a biological lost cause. It’s a risky approach because Jarmusch’s movie sometimes becomes an example of the statement it’s making, an entertainment that can feel more like it has been embalmed than edited. There’s something to be discovered amid the resignation and ruin, a feeling that the movie’s vampires — played by Tilda Swinton and Tom Hiddleston — are remnants of a dying breed, symbolic holdovers from the last days of a reeling counterculture. Hiddleston’s Adam lives in a deserted part of Detroit in a house full of electronic equipment that supports his musical habits. Adam spends most of his time recording all the parts of various tunes in his junk yard of a home. Adam also nourishes himself with blood he buys from Dr. Watson (Jeffrey Wright), a doctor who runs a blood bank in a nearby hospital. Adam always arrives unannounced, sporting a flimsy doctor’s disguise. When he drinks blood out of a wine glass, Adam — like movie’s other vampires — swoons like a heroin addict experiencing the relief of a first rush. 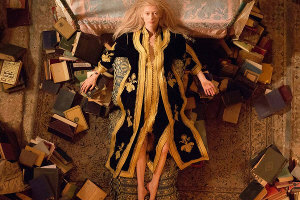 Swinton’s Eve lives in Tangier: She reads compulsively, and obtains her blood supply from Elizabethan playwright Christopher Marlowe (John Hurt), a vampire who’s clearly devoted to Eve. Restrained as the tone can be, Jarmusch’s movie virtually screams out for metaphoric or ironic interpretation: Adam and Eve, for example, seem more like the last couple than the first. And immortality — or as close as former humans can get to it — has its burdens. Suffering from spiritual exhaustion, Adam contemplates suicide, a wooden bullet to the heart. Concerned about him, Eve — his long-time lover — decides it’s time for a visit. She flies to Detroit to elevate Adam’s spirits. When Eve travels, she carries a couple of suitcases containing nothing but books. Adam’s also concerned about what humans — he regards most of humanity as the walking dead and calls them “zombies” — have done to the planet, contaminating the blood supply and despoiling the very Earth upon which they walk. That’s the rub, though. No matter how contemptuous vampires are of humans, they can’t live without them. The lumpen masses feed the vampiric elite. Not a lot happens. An eager-to-please human named Ian (Adam Yelchin) drops in on Adam from time to time, bringing a sampling of guitars and other paraphernalia to satisfy Adam’s musical cravings. Late in the movie, Eve’s sister Ava (Mia Wasikowska) arrives for a visit: Ava’s boisterous, undisciplined and liable to sink her fangs into a human, an activity that Adam and Eve disdain as barbaric. Is it disparaging to say that Swinton was born to play a vampire? Could there be an actress more suited to pallor? Hiddleston — known for his work in The Avengers and Thor movies — shows a different side of himself, and it’s always a pleasure to see Hurt, who seems to be decaying before our eyes. Jarmusch is now 61, and it’s tempting to view Only Lovers Left Alive as a kind of dirge for a lost cultural moment that he cherished. Is Jarmusch wondering whether even vampires have the energy for one more bite? I don’t know, but Only Lovers Left Alive feels less like an artistic summation than a last gasp.